TriMet is proposing to add service to eight bus lines for fiscal year 2017 to help improve reliability, better match rider demand, connect people with jobs and ease crowding. The proposed changes are driven by a new stream of revenue from last year’s passage of an increase in the employer payroll tax, which will mean new or improved service twice per year—in September and March—for the next 10 years. Details on the proposed service improvements are published online where people also can provide feedback and sign up to receive email updates. 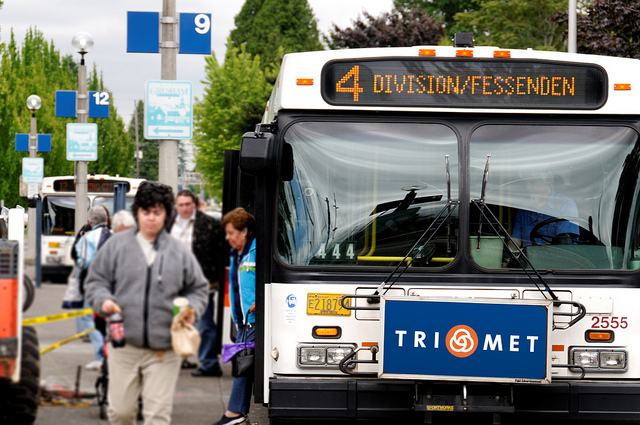 TriMet has added service every year since 2012, with a focus to connect workers with jobs, educational opportunities and meet growing demand. TriMet’s fiscal year 2017 runs from July 1, 2016 to June 30, 2017. We’re proposing to add more buses to serve Line 4-Division/Fessenden to connect better with early morning and late-night work shifts. There will be an open house Thursday, Feb. 25, to allow community members to voice their opinions about proposed bus-service changes for September 2016 and March 2017. Line 71-60th/122nd Ave serves the Maywood Park Campus. Plan your trip there using our Trip Planner. In addition to the open house and website, people can also provide feedback on the bus service improvements by sending an email to comments@trimet.org or by calling 503-238-RIDE (7433). 4-Division/Fessenden: Add early morning and late-night weekday buses to accommodate early and late work shifts. 32-Oatfield: Increase weekday hours of operation. 36-South Shore: Run buses on Jean Road to Jean Way and Boones Ferry Road to better serve the Lake Oswego Commerce Center and other employment. Discontinue service on Pilkington Road, Childs Road, 65th Avenue and McEwan Road due to low ridership, which will improve on-time performance at other stops along the route. 63-Washington Park/Arlington Heights: Add Saturday and Sunday service to provide trips through Washington Park and neighboring areas. 71-60th Ave/122nd Ave: Split into two bus lines. One line will continue to run on its current routing and frequency along 60th Avenue between Parkrose/Sumner Transit Center and Clackamas Town Center. The other line will be renamed and renumbered and continue to run between Parkrose/Sumner Transit Center and SE 94th and Foster. It also will have additional weekday trips. 20-Burnside/Stark: More frequent buses on weekdays during peak and midday hours to better meet demand. 21-Sandy Blvd/223rd Ave: Add weekday trips during rush hours to better connect people to employment. 155-Sunnyside: Extend the line to SE 172nd Avenue to serve the Happy Valley Crossroads development. Discontinue service on 157th Avenue, Misty Road and 162nd Avenue. When looking at expanding service and the future of transit, our first priority is to maximize the benefit to riders, especially those who are connecting to jobs, educational opportunities, community services and other activities. This means service that begins earlier in the day and later into the evening, ensuring that where jobs grow, so does our service. The service expansions are based on our comprehensive Service Enhancement Plans (SEPs) we developed with key stakeholders, businesses, residents and riders over the past four years. The 10-year phase in of the tax revenues will fund about one-third of the SEPs, as they are 20-year visions for the future of transit. We’re also improving reliability, safety and comfort for our riders by purchasing new buses. As part of our ongoing bus-replacement program, we’re adding 77 new diesel-powered buses, all of which will be in service by the end of May. We plan to acquire 50 more in FY2017, 57 in FY2018 and 70 in FY2019.